Nevertheless, Jeb is a Bush. And if Bushes are anything, they are a family of super-competitors. Ferociously so, across the board. “At everything from tiddlywinks to backgammon,” says former baseball commissioner Fay Vincent, a Bush family friend. They take their contests so seriously they give no quarter even to the youngest members of the family. Which George H.W. learned the hard way when he was just a small boy and his mother, Dorothy Walker Bush, beat him mercilessly at tennis, “right-handed and left-handed,” Barbara says. I have this picture in my head of the next Bush family get-together up in Kennebunkport. For Easter, maybe. Yeah, Easter. That'd be good. The servants retire and the family sits down at the dinner table. 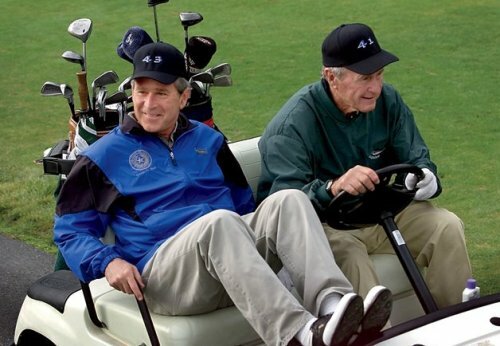 On a signal from Poppy, he and Dubya put on their "41" and "43" caps. Barbara then scales a cap over the carved ham and into Jeb's lap. He picks it up and discovers it's a mate to his father's and brother's caps – except it has the number "0" stitched on the front. "You want us to clap now?" smirks his brother. "Or maybe we should see how you do in the Easter egg hunt first," chips in his dad, with his trademark crooked grin.